LAPSSET Corridor Development Authority [LCDA] board of directors Chairman Titus Ibui addressing journalists at Voyager Beach Resort in Nyali constituency, Mombasa county. Lands Chief Administrative secretary Gideon Mung’aro addressing journalists. 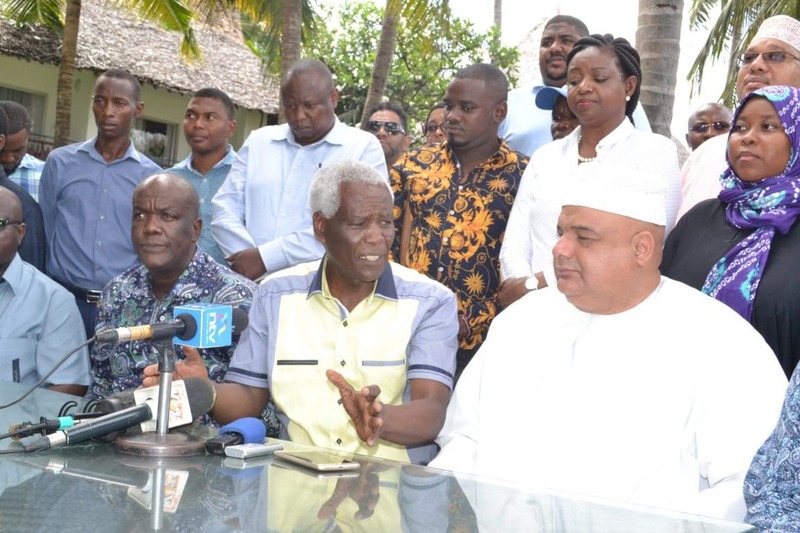 Lamu leaders led by Lamu governor Fahim Yasin Twaha have asked the national government to appoint two people from the county to the board of the LAPSSET Corridor Development Authority (LCDA). Speaking at the Voyager Beach Resort in Mombasa county the county boss said this will ensure they will participate in decision making of the project in the county. “Including one of our own to serve as a member of the board will ensure the right decisions are made,” he pointed out. Twaha said the move will also ensure the board makes decisions after the participation of locals on the ground. He urged Lapsset to make prompt payment of outstanding Sh272 million rates which the Lappset project owes the Lamu County as land rates and cess, compensation of land owners and fishermen, employment opportunities to locals and education scholarships to avoid last minute hiccups. Last month a similar meeting had ended with Twaha, MPs Stanley Muthama (Lamu West), Athman Sharif (Lamu East), Lamu Woman Rep Ruweida Obbo and MCAs staging a walk out citing failure by the national government to listen and address the grievances of the locals on the project.